A little bit cake… a little bit brownie… a whole lotta chocolate! 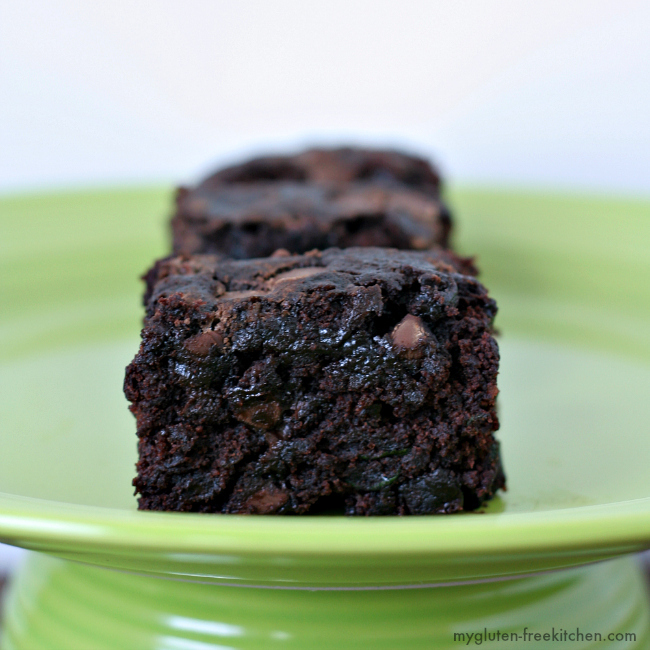 That’s how I would describe these delicious gluten-free zucchini cake brownies! I promise that you can’t tell there is zucchini in them! You can’t taste the zucchini in baked goods like this, it just lends the moisture needed to make these the perfect texture. These delicious brownies are also egg-free and dairy-free! We currently are harvesting several HUGE zucchini every week so I’m looking for new recipes to help use it up. The rest of my family isn’t quite as crazy about eating zucchini as I am, so I am trying to use it in recipes where it doesn’t even taste like it is in there. I searched online and it seems everyone uses the exact same zucchini brownie recipe, some with frosting, some without. 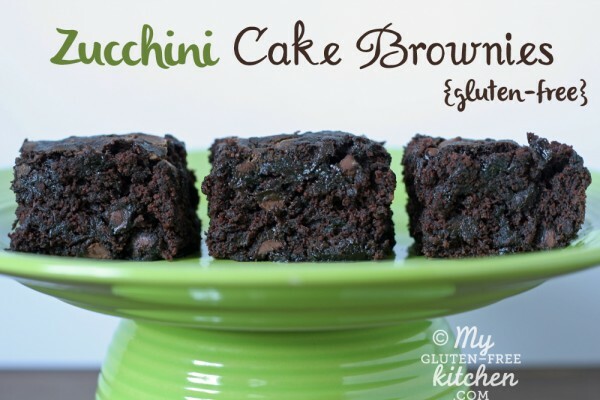 I started with the obviously tried and true zucchini brownie recipe that I found all over the internet, made a couple substitutions to make gluten-free, and also made a few other changes to make it healthier and tasty! The result is a super moist, very chocolatey, cake-like brownie! The first time I made these, I used an 11″ x7″ glass pan. The brownies were tall and delicious, but very hard to cut nicely and make for a nice presentation. The second time I made these, I decided to use my new brownie bar pan from Pampered Chef (which is just like this one: Brownie Bar Pan ). My hope was that the brownies would turn out just as tasty, but would be in perfect servings that would be easy to get out of the pan. It worked beautifully! I will definitely use the brownie pan for making these in the future too. If you want to make sure no one can detect the zucchini by sight, you’ll want to peel the green part off the zucchini before shredding. I wasn’t trying to hide all evidence of it, so I didn’t care that you could see just a few specks of green here and there in them. Again, you can’t taste it either way, but if you are trying to hide it from a picky eater, I thought I’d let you know how to do that! Also, if you are using super big zucchini, cut it into wedges and discard the seedy center before shredding. For ease, I usually shred several zucchini at one time, or just a huge one at once. I use my food processor with the shredding attachment to do it quickly and easily. I then measure out what I need and freeze the rest in portioned bags. Since these were so good, I’ve made them many times now. I have tested with Gluten Free Mama’s Almond Blend All-purpose Flour , and gfJules gluten-free flour. Successful results with both, so I recommend either one! If you need this to be dairy-free, make sure to use dairy-free chocolate chips like Enjoy Life Semi-Sweet Chocolate Mini Chips , or omit the chocolate chips. I hope you can make this soon and enjoy! Happy gardening, harvesting and baking! Looking for more brownie recipes? Check out all of my gluten-free brownies & bars. 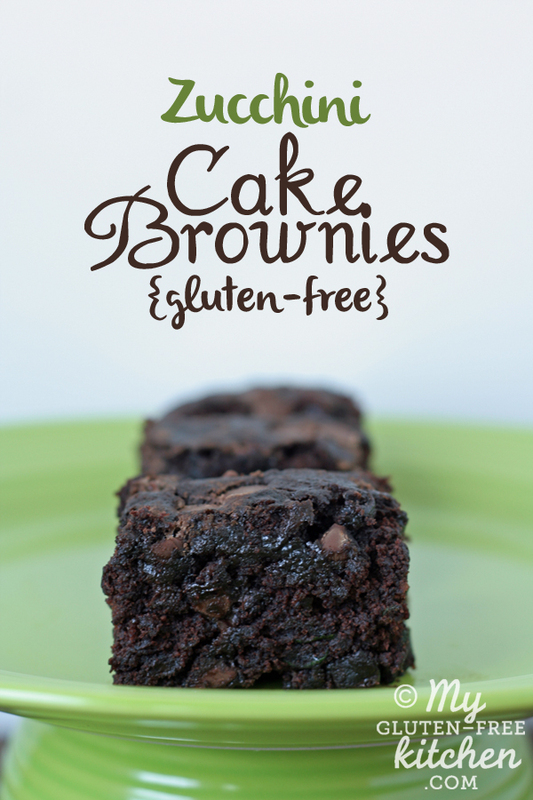 For more gluten-free recipes, be sure to follow my Gluten-free Goodies board on Pinterest! A little bit cake... a little bit brownie... a whole lotta chocolate! If you need this to be dairy-free, make sure to use dairy-free chocolate chips like Enjoy Life Semi-Sweet Chocolate Mini Chips , or omit the chocolate chips. In a medium bowl, whisk together the flour, xanthan gum, baking soda, and salt. Set aside. In the bowl of your electric mixer, beat sugar, applesauce, butter/margarine/oil, and vanilla extract for 30 seconds. Add flour mixture and continue beating for about 1 minute, until mixture resembles wet sand. Add the shredded zucchini, then the cocoa powder, and mix on low until combined. Stir in the 1 cup of semi-sweet chocolate chips. Pour brownie batter into greased 7x11 pan or use a cookie scoop/ice cream scoop to scoop into brownie pan. Sprinkle extra 1/3-1/2 cup semi-sweet chocolate chips over the top of brownie batter. Bake 7x11 pan at 350° for 25-32 minutes, or until brownies are set. (Due to chocolate chips in batter, it is hard to get a toothpick to come out entirely clean). If using brownie pan, bake brownies at 350° for 15-18 minutes or until brownies are set. Let them cool in pan about 4-5 minutes, then gently use a spatula to remove. My little Pampered Chef metal spatula worked great at getting them out. Serve at room temp or warm for about 10 seconds for a truly melty, gooey dessert! *I've tested this with Gluten Free Mama's Almond Flour Blend and gfJules flourand recommend either! If using a flour blend that already includes xanthan or guar gum, then omit the xanthan called for in the recipe.As always, be sure to double-check your ingredients for gluten. These turned out tasteless and spongy for me tonight. I’m so sad, wonder what happened? Bex, Oh no! First off, what flour blend did you use? That plays a huge part in texture in gluten-free baked goods. As far as the taste, when the recipe is made as listed, there is a lot of great flavor. Is it possible that you forgot an ingredient? I do that often!! I hope you can figure out what might have gotten left out. These are quite flavorful! I’m so sorry that something went wrong! I know how frustrating that is when you make something and it doesn’t turn out! I hope you’ll try it again. Mine were also tasteless and I even added cinnamon to try and spice it up. Aside from the flavor, they had a gummy texture with a flour mix (Namaste brand flour mix I buy from Costco) I use regularly in similar recipes with success. I sure do not recommend this recipe! AWFUL! What a waste of perfectly good zucchini and expensive flour. Ashley, I’m so sorry that you had these results. I’m trying to figure out what might have went wrong for you and for Bex, as I’ve made these several times and they were moist and chocolatey for me. I just got some zucchini from a friend and will be making them again this next week to see if I can figure out any problem with my recipe. Thanks for letting me know what flour blend you used. Did you make any other substitutions to the recipe? I made these a few weeks back. They were ooey-gooey, melty yumminess. But I did encounter some issues. I don’t have an appropriate sized metal pan, so I used what I had – a light colored glass Pyrex dish. Even with increasing the bake time they never seemed to set up, especially in the middle. Very important, I think, to use one of those metal brownie pans with the individual wells so that the gluten-free flour has a chance to firm up into shapes. Gooey chocolatey dessert is what I had been missing so it worked out fine, but I wouldn’t want to share them with people like that. I’m glad you liked them Valerie. I totally agree about them turning out best in a pan with places individual servings, really even a muffin pan would work if you don’t have a brownie pan. I’ve also noticed that how wet your zucchini is definitely affects the outcome. I made these last year during zucchini season, several times. Not only did I think they were delicious, but many, many other people commented on how great they were. One little boy ate several pieces and said they were as good as his grandma’s. No one believed they were gluten, dairy and egg free. By the way, I used King Arthur’s gluten free flour and it worked very well. Just a bit crumbly, but oh what delicious crumbs. I am making them again this weekend for our Farm Ramble open house. Thanks for a great recipe. Sally, Thank you for leaving a comment and rating for these. So glad you liked them. Thank you also for mentioning which flour blend you used. I’m so glad it worked well for you! I just found this recipe, I wanted to make them for my son who’s dairy intolerant. But semi-sweet chocolate has milk in it, so how are these dairy free? Sarah, Thanks for your question. In the blog post, I mentioned: If you need this to be dairy-free, make sure to use dairy-free chocolate chips as well, or omit the chocolate chips. I’ll add that to the recipe as well since you pointed it out. I should have put it there. I made these last week with the Enjoy Life chocolate chips which are dairy free, and they were very good! Hope you’ll try them! The recipe is on Pinterest. The picture that is saved stated to replace chocolate chips for dairy free! Yummy and fluffy! I used bobs red mill all purpose flour and coconut oil and instead of zucchini I used squash. I couldn’t believe how fluffy they were! Thank u! Thanks so much for commenting with your successful substitutions for the recipe. I’m so glad you liked how they turned out! Happy Baking! Could you maybe figure out and list the nutritional facts to these? Please and thank you!!!! This recipe is amazing. Delicious, moist, and no one guessed they were gluten-free. So glad to hear that you liked these! Thanks for letting me know they turned out moist and delicious for you! I’m not sure about subbing honey, but I think the coconut sugar would work just fine in place of the regular sugar called for. Suzanne, Hope you’ve gotten to try these and enjoy them! Thanks for your comment. We used Bob’s Red Mill all-purpose GF flour. We also did not have the 7×11 pan, and instead divided the batter into 1 large and 2 small loaf pans, bread style. The large pan was definitely gooey in the middle, even after 15 more minutes of cook time. The smaller pans were firmer, but still VERY moist. We did not peel the zucchini so our finished product had a bitter taste. Next time I am going to peel the zucchini and try a 9×13 pan. It’s great to see such a healthy recipe but sad that margarine and canola oil are recommended as options. They are so both terribly bad for you. I would definitely use coconut oil! Thank you for the recipe though. I hope to give it a try soon. Do you have any recommendations for adding egg? Do you think I can add a couple to the recipe without changing it? Thanks! I’ve only tested with butter, but include the other substitutions as I know people have been successful with those as well. I’d love to try it with coconut oil soon too. Let me know how that works for you. It would definitely change the texture if you add eggs – make it more cake-like and less brownie-like. If you would prefer that texture, you can definitely try that. Let me know how it goes! Happy Baking! I made 12 muffins out of the picture and a cake. The muffins turned out great,moist and chocolately. The cook took a little loger to cook but still turned out great. I think next time I would decrease the amount of chocolate chips and maybe add some shredded carrots, more zucchini and some nuts to add alittle cruch. Overall I was impressed with this recipe especially for a gluten free dessert and my kids like it too! Glad you and your kids liked them. I think those ideas for making it a bit healthier next time sound great! This looks delicious! I’m GF and DF so I can totally make this recipe. Pinning it, thanks for sharing! Hope you can try is soon Beth! These came out perfectly! I used half rice flour and half almond meal (because that’s what I had on hand). I am aware of the almond meal texture, but it’s not bad. 9×13 metal pan for 25 mins. Thank you for this recipe! Glad those changes worked out perfect for you! Thanks for commenting! I used this as a base for making up some brownies last night! I used the King Arthur gluten free flour mix. Here’s the modifications I made: only used 1 cup of sugar, added an egg to make them a bit fluffier, and added 3 tbsp natural peanut butter and 2 tbsp PB2 powder (to get a stronger peanut butter taste with out adding in more fat). Turned out great – now to only pace myself so I don’t eat them all at once! Love your peanut butter additions. That would give this an entirely different taste. Glad they turned out great. Love your creativity and willingness to give things a try! Can coconut flour or almond flour be used? Anyone tried those with this recipe? Because I mixed up my gf baking mix with the flour and used the same amounts of flour and everything else. I added a egg to the mix. Put it into a small glass oblong cake pan. I had to bake it the same amount. The brownie cake came out great. Next time I’m putting pecan frosting on them. Glad that it turned out great! Love your idea for pecan frosting next time! I made these brownies two weekends ago. I used my own gluten free blend. I cannot tell you how wonderful these brownies were. I shared them with some of the teachers that I work with and they could not believe they were gluten free. This recipe is a winner and I willl most certainly make them again. Thanks for the recipe! What is the nutritional content of this recipe…by that I mean Calories and carbs? I used my own gf flour blend (Teff, organic brown rice, Sun Flour Mills whole grain pastry flour, & chickpea flour) I also added a 1/4 of a cup of chocolate whey protein to the blend. I used 1/3 ghee, 1/3 avocado oil, and 1/3 hemp oil. I also only used 1 cup of sugar (beet sugar). I did peel my zucchini before I shredded it. I couldn’t get the zucchini shredded down small enough for my liking but, it did really add the moisture as you said it would. Now it is 1AM and I am just waiting for them to come out of the oven 🙂 I tasted the batter before cooking and it tasted wonderful so hoping they taste as good once cooked. I just made these tonight. I don’t have a GF flour blend so just used what I had (1/2 cup each of buckwheat, coconut, almond and amaranth flours). I used coconut sugar instead of the white stuff and didn’t even measure out my zucchini, just eye balled using a med size one (with skin on!). I did not have the correct size of pan noted so simply scooped some into muffin tins and the balance into a mini loaf pan. I’m pretty sure I only cooked for 15 mins and then let them set for a bit in the warm pans. They turned out great – half gone already! Not sure what the complaints are for as I’m not even sure I followed the recipe but they turned out great! This was my first attempt at gluten free. AMAZINGLY DELICIOUS!!! I used 1 cup of sugar and 1/2 cup of applesauce. Next time I will use 1/2 cup of sugar and 3/4 cup of applesauce. My goal is also sugar free. I used Pamela’s Baking and Pancake Mix. It was even expired! I didn’t realize that when I bought it but I didn’t feel like returning it. I’m not a stickler for dates. I baked it as directed. The outer edges were to die for but the middle was not done. I cut the edges off, spread it out, baked it for 15 more minutes, and it was done! I baked it in 5 min intervals. VERY, VERY IMPRESSED!!!! I made these yesterday and they were really yummy. Thank you! I made them in the 7×11 glass pan, and after baking for the max time, they were still quite gooey in the middle. We ate a couple of them and then put the rest back into the oven for another 15 minutes, and they set up better after that. I think next time I’ll try making them in cupcake pans. The zucchini I used was large and somewhat mealy – maybe that’s why they were so gooey? I used Bob’s Red Mill Gluten Free Flout Mix. Thanks again for this recipe! Just made these! Was searching for a good gf recipe That’s also dairy free for a friend. Amazing!! After reading info/posts I did them in muffin tins & grabbed some gf King Arthur flour at the store & I had great results! (Never tried that kind before) I only had the namaste brand on hand from costco. Look forward to trying it again when I get more gf mamas almond blend flour ???? I’ve made this recipe now maybe a dozen times. Sometimes I use an egg if I don’t have applesauce on hand. It turns out amazing every time! People now ask me to make this for them. Thank you for the recipe! I was not sure about this recipe but did it turn out wonderfully! Used 1/4 c yogurt for applesauce and Carol Fenster’s flour blend and less sugar,about a cup. We put less chips in the batter then sprinkled more on top to melt into a chocolate “frosting”. Warmed up with frozen yogurt…too yummy! Thank you sooo much for this recipe. My GF son is beyond happy as he needs this large amount of zucchini for good digestion. I made this recipe for my husband’s boss who was recently in town and he thought that my chocolate concoction was amazing. He has Celiac’s disease and isn’t able to eat wheat flour. I used Pillsbury’s GF flour made with pea and rice flours plus tapioca and potato starch with xantham gun already added. Our garden has been producing a ton of zucchini, so I have trying lots of recipes to use it. I know this recipe was to be egg free, but went ahead and added 2 eggs. I used some dark chocolate mini chips and some milk chocolate chips to the mix, too. I bake GF for friends and have been successful with several recipes. I will do some research to see if I can substitute regular wheat flour to make this again for my family. Great recipe! Tried this recipe today, made everything according to the recipe and it was a total disaster. Baked for 40 mins and it is still raw inside. Had to throw everything to the garbage. The sides which baked does not taste like browny anyway… They were more like a muffin, rather than chewy browny. Happy others have more success with this one. Same issue here. It was not good. Cooked on the outside and was cake like and the middle was raw. Gritty taste. I think it was the flour I used. Pillsbury GF. Waste. After the flour mix and sugar mix are blended to resemble sand, the zucchini and cocoa powder are added. At this point, is it still supposed to resemble sand? Mine is barely starting to clump and certainly does not resemble a batter. Given the mixed success of repliers, I wonder if this is the sticking point? If the batter is still crumbly, should a baker add some water, oil, or more egg substitute until it resembles a batter? I just finish baking mine, waiting for them to cool. In the meantime, I tasted it with the spoon I used to flatten it down a bit in my glass pan. These brownies are AMAZING! I made a few adjustments: used Arthur Kings Flour, used coconut oil to grease pan, used just 1 cup of sugar (sugar in the raw) instead because my apple sauce was sweet. I baked for an extra 10 minutes. I also added pecans (can’t eat brownies without them). Thanks sooooo much! By the way, I also made your gf chocolate chip cookies and those left me speechless! Your baking is incredible! These turned out great – super moist and nice flavor but not too sweet. I used Bob’s Red Mill 1 to 1 Gluten Free Baking Flour and baked them in a mini bundt pan. No trouble getting them out of the pan either. Will definitely be making these again with our abundance of zucchini from the garden this year! The batter was super dry once I mixed everything together. I tossed in three free range organic eggs and the batter looked about the right consistency. I baked for 45 min they turned out amazing! My daughter has celiac and she misses out a lot on treats made with wheat. These will become a staple in our house. I baked it in the toaster oven for 35 minutes in an 8×8 pan and it still did not bake in the centre. Very disappointing.